Sochi halfpipe, Olympic snowboarding: The seething resentments behind snowboarders' hatred of the Sochi halfpipe. 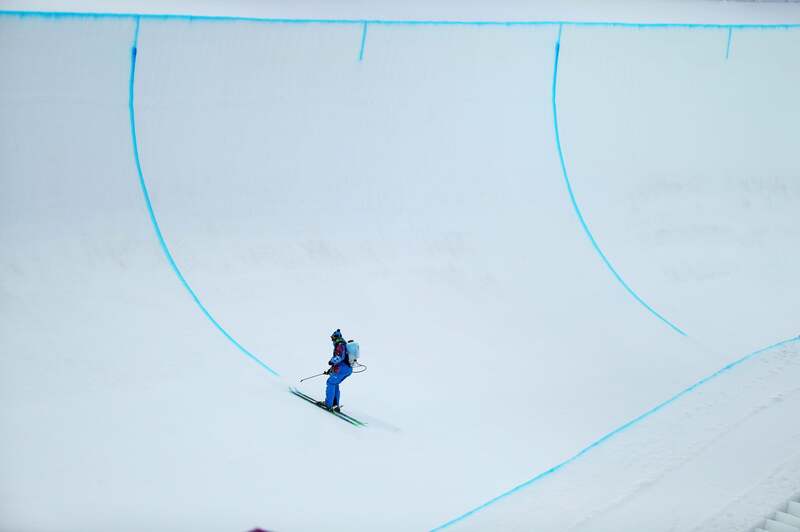 The halfpipe is marked up during day three of the Sochi 2014 Winter Olympics. While there undoubtedly are problems with the Sochi halfpipe, many of the issues can be blamed on the warm weather. It’s hard for even the most skilled technicians to keep a halfpipe in immaculate condition when it’s above freezing. But there’s more to it than that. The harsh criticisms voiced by Bright, Davis, and others trace back to a long-standing rift between snowboarders and the sport’s international governing body. The people hired to design and construct the Olympic venues are professionals with experience building courses for international competitions and the International Ski Federation (FIS) circuit. But they’re not the same people employed by the events favored by much of the snowboarding community—and that’s the crux of the problem. What does this have to do with the Sochi slopestyle course and halfpipe? It comes down to the FIS choosing to do things its own way rather than listen to what snowboarders want. When they’re not at the Olympics, the world’s top snowboarders perform on various pro tours, at ESPN’s Winter X Games, and at showcases that cater to snowboarders’ preferences and grew out of snowboarding culture. The halfpipes and slopestyle courses at the Winter X Games and other pro events are built by an American company called Snow Park Technologies. Snowboarders love Snow Park Technologies, a firm they believe truly understands what kinds of courses allow athletes to perform at their best. When Danny Davis says the course “needs a lot of work because they hired the wrong folks to do it,” he means that the IOC screwed up when they didn’t hire Snow Park Technologies. Olympic-quality snowboarders hate that the FIS refuses to hire who they believe are the best, most knowledgeable course designers. Instead, the FIS—perhaps understandably—prefers to use its own people, generally non-American designers with experience building for FIS events. Fair or not, a lot of snowboarders see these companies as vastly inferior to American builders. For snowboarders, this is just another example of FIS imperiousness. And that’s why the complaints over the Sochi halfpipe have been so loud and bitter.